Home / 2017 / February / Design and Construction team celebrate completion of Hill Hall renovations. 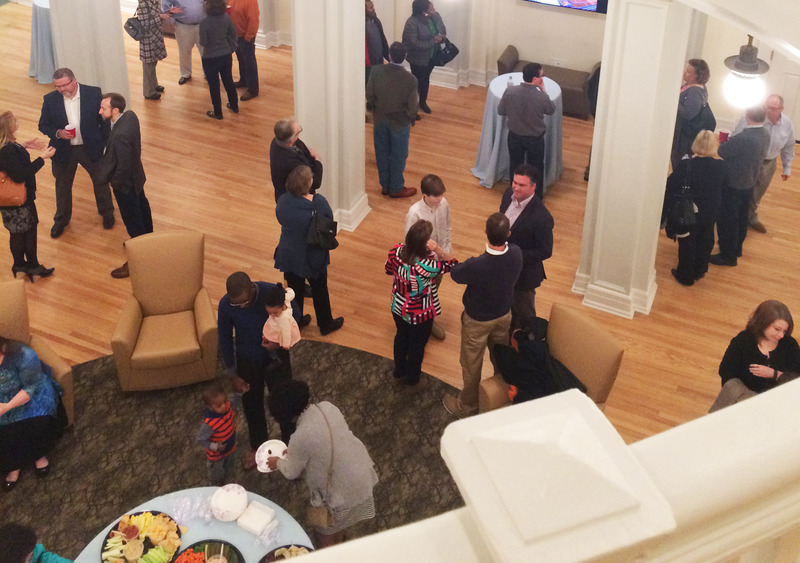 Members of the design and construction team gathered last night, February 15th, to celebrate the completion of the newly renovated Hill Hall at UNC Chapel Hill. Originally built in 1907, the building will turn 100 this year. Renovations included the installation of a climate control system, state-of-the-art acoustics, a new stage, and equipment and piano lift. Additionally, the two-story rotunda was renovated to better accommodate receptions, intimate performances, and gathering space for the department. The backstage area includes updated dressing rooms and storage, new lighting, and updated administrative and teaching spaces. Falcon provided asbestos and lead surveys, geotechnical engineering, and special inspections for the project. Quinn Evans Architects served as the Architect and Barnhill Contracting served as the Construction Manager.